April, 2018 – Dayco, a leading engine products and drive systems supplier for the automotive, industrial and aftermarket industries, today announced it will launch its first stand-alone water pump in North America, this March. The initial range provides coverage for over 200 million vehicles in operation (VIO). 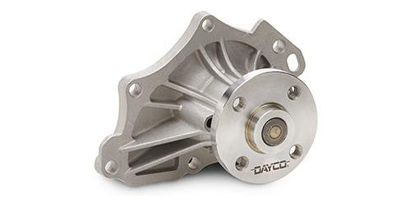 Dayco has a global reputation as a top quality OE manufacturer and supplier, and the new Dayco water pumps are naturally manufactured to the same high standards as the many existing components the company manufactures and distributes globally. Each Dayco water pump features the latest technology, which includes upgraded materials for the bearing, impeller, gasket and is 100% end-of-line leak tested. “With this introduction, we provide our customers with a high-caliber component that carries the same hallmark for quality as the existing Dayco product range. The new Dayco Water Pump offering allows our customers to cater to a different although complementary product group,” said Massimo Falco, Director of Global Aftermarket Marketing. Each Dayco water pump features the latest technology, including low friction seals, which are arguably the water pump’s most critical component because the seal must not only prevent coolant leakage, but also provide a long service life. As a result, the highest quality materials have been used in the seal manufacturing process. Additional design features include coolant-resistant, long service life grease for the bearings and pump specific impellers that are optimized for each individual application and designed to ensure efficient coolant flow throughout the engine and prevent cavitation within the coolant. Impeller design is extremely complex and requires both high-tech software and comprehensive real world testing to ensure the performance of the finished product. Finally, the main water pump bodies are designed to support external loads from the associated components in the drive belt system, as well as engine vibrations and thermal movement, while remaining perfectly watertight in all conditions.